CHAPEL HILL – Thinking about college doesn’t start when you’re a senior in high school. It starts in middle school, if not sooner. Or – especially if no one in your family has been to college – sometimes not at all. Part of the reason UNC Chapel Hill won the $1 million Cooke Prize for promoting access to higher education is First Look, a program that welcomes middle-school students to campus to demystify college. First Look tries to help first-generation students from the state’s poorest counties see themselves on a college campus. “Our goal is for these kids to be able to picture themselves in college,” says Missy Julian-Fox, director of the UNC Visitors’ Center and First Look. The youngsters get to walk around campus, eat in a dining hall, visit Kenan Stadium, rub shoulders with college students and ask questions. The UNC System wants to address it as well. 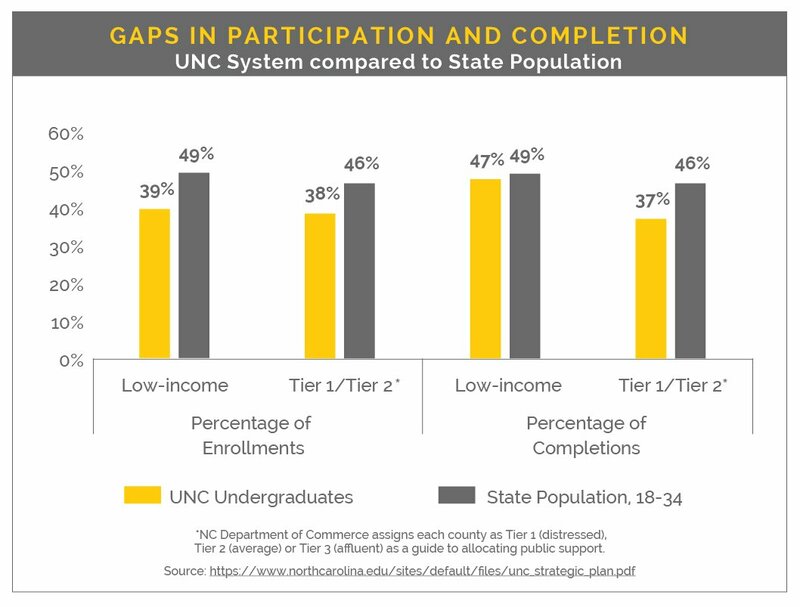 The system’s new strategic plan calls for all 17 UNC campuses to increase enrollment among low-income and rural students. FIRST LOOK has been at it since 2008, when it began with a visit from a class of 5th-graders from Person County. It welcomed 6,000 students last year and has hosted visits from 62 NC counties. “The phone has never stopped ringing,” Julian-Fox says, as teachers search for ways to introduce their students to college. The students typically arrive in groups of 100 that meet first as a group for 20-30 minutes. • 65% of jobs in the U.S., or almost 2/3, will require college by 2020. • Over a lifetime, college graduates earn $1 million more than those without a college degree. • College graduates are less likely to face unemployment. They hear about financial aid, including Pell Grants, the Carolina Covenant and other scholarships. “Do not let the price tag stop you from going – there are ways to pay,” Julian-Fox says. They then break into groups of 10 to 12 to tour campus with a Carolina student guide – a “near-peer” who is often a student from a similar rural or low-income background. They discuss ways that college connects with students: academics, art, sports, campus life, student living, study abroad. With their First Look Guide, middle school students look at a college campus through the lens of their own experience, comparing and contrasting what it would be like as a college student. They eat in a dining hall with college students. They visit a lecture hall, a makerspace with 3D printers, and landmarks such as the Old Well, Old East and South Building. They learn the chancellor is like the principal at their school. 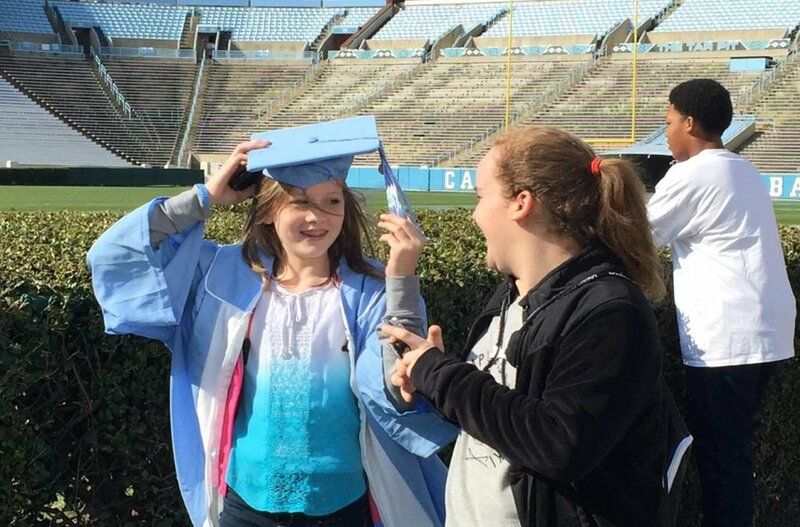 AT KENAN STADIUM, the guide pulls out a cap and gown and lets the kids try it on, then asks one to continue wearing the graduation garb. They then proceed to a theater-in-the-round classroom, where the Department of Psychology and Neuroscience performs engaging experiments. “It’s a peek inside a college classroom,” Julian-Fox says. Then the students who are still wearing caps and gowns go through a mock graduation – complete with “Pomp and Circumstance” and spontaneous applause. The tour promotes college life in general – it doesn’t try to tell kids they must come to Chapel Hill. “I don’t know if this is going to be the best fit for them,” Julian-Fox says. “Everything we’re doing is trying to connect their middle-school experience to a possible future in college,” Julian-Fox says. JULIAN-FOX still recalls that first visit by the class from Person County. A Covenant Scholar answered the girl’s question. FIRST LOOK has to turn away 2,000 to 5,000 would-be student visitors a year, Julian-Fox says, because her office doesn’t have the capacity to serve every school that wants to come. The program is developing a very realistic virtual-reality app to share with those who can’t come walk the actual brick walkways. Julian-Fox envisions a program like First Look at every college campus. “First Look is a model that transfers to any campus in America,” she says.